For a period of eight months, students from the Gerrit Rietveld Academie at the departments of Image & Language, Graphic Design and Photography have immersed themselves in the Cobra movement (1948-1951). In this project, the students respond to the material and immaterial legacy of Cobra and the Cobra Museum as an institute. Their subjects concern the experimental and spontaneous working methods of the Cobra artist, their focus on (international) collaborations, written manifestos and the diverse disciplines within the Cobra movement. 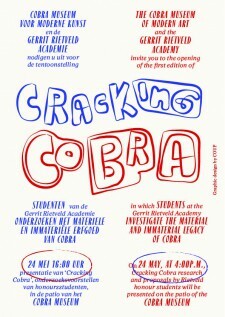 On 24 may 2013, cracking Cobra introduces the research of students. The project proposal are temporary interventions that respond to existing exhibitions and activities of the museum. The interventions themselves will take pace during the summer, beginning on 7 June. Cracking Cobra is an initiative of the Open Collection Programme of the Cobra Museum and is supported by the Mondriaan Fund.